Everyone who raises at least $100, or donors who make a single gift of $100 or more, will be granted access to our Miracle Maker Hospitality Area. Shady spots, cold drinks, and special treats await our supporters in a newly improved space at the park. All registrants receive a commemorative race t-shirt. Sizes not guaranteed on race day. The first 2,000 entrants in the 15k will receive a tech tee. The first 2,000 registrants in the 5k will receive a cotton tee. 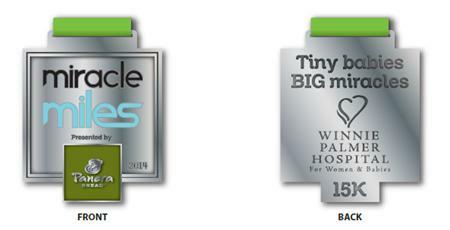 The first 2,000 15K finishers will receive this special medal for completing the 15K race. Join us again this year for the FREE Kids’ Fun Run, a race that is like no other! Each child will receive a finishers' ribbon. NOTE: Kids' Fun Run registration available day of race at race site ONLY. All participants and guests now have the opportunity to visibly show their support for tiny babies. Walk-for-Winnie is a symbolic walk. Join the fun, as we demonstrate our support for all the tiny babies and their families running their own race. To donate to the NICU, click here. Use Facebook to Leave a Comment on Miracle Miles 5k & 15k Presented by Panera Bread - We'd love to hear from you!